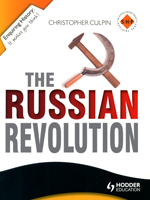 The Russian Revolution examines Russian history from 1894-1924 - the stories, settings, characters and issues that make this such an extraordinarily important and popular topic. The enquiries have an obvious focus on causes but also on interpretations. Each new generation of historians has interpreted these events through their own lenses - their own time, place and political standpoint - making this topic one of the most powerful for understanding how history is written and how interpretations are formed. 1 Russia in 1900: Who were the Russians and what were their hopes and fears? 3 Was Tsar Nicholas II mainly to blame for the 1905 Revolution? 4 Russia in 1914: on the verge of revolution? Or becoming a Western-style democracy? 5 Why was there a revolution in February 1917? 6 The October Revolution: rising of the masses or coup d'etat? 7 Was it the Civil War which turned Bolshevik revolutionaries into Communist dictators?